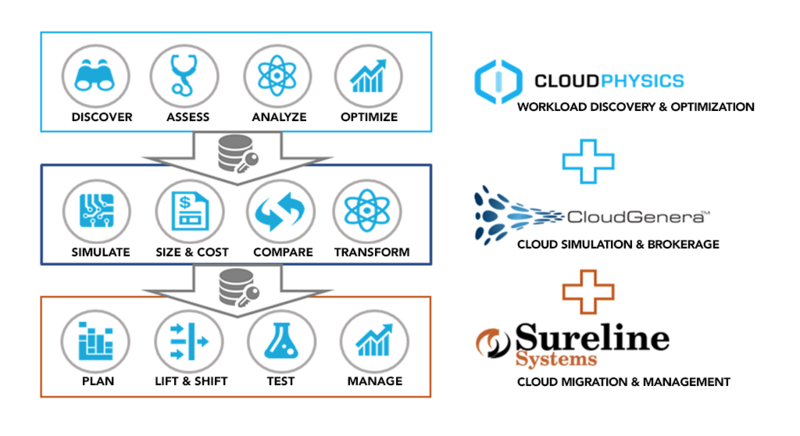 April 26, 2018 – CloudPhysics, based in Santa Clara (CA), a global leader in IT Operational Intelligence that enables truly collaborative partnerships between Customers and Solution Providers to transform data centers, and CloudGenera, based in Charlotte (NC), a global leader in enterprise-class risk and compliance decision engines for cloud migration analysis, today announced a strategic partnership to deliver a framework for cost-effective, fully compliant, risk-mitigated cloud migration projects that maximize the value of your organization’s technology spend through automation and intelligence. Increasingly, IT organizations are coming under pressure to deliver flawless IT application services while at the same time reducing cost and complexity. Moving to the cloud helps, but can place an additional strain on the organization, at least in the short term, while the organization transitions to the cloud. CloudPhysics and CloudGenera deliver solutions and services to help guide IT organizations through the typical project stages, including define strategy and requirements, assess current infrastructure and applications, compare options and providers; assess risk and compliance profile, develop actionable recommendations and create a business case for management, ultimately moving from decision-making to provisioning. CloudPhysics is one of the market’s fastest growing channel intelligence platforms, designed to enable data-driven collaborations. Our platform ensures customers succeed in their adoption of products and services for next generation IT infrastructure. Combining an agile SaaS platform with a global partner network, CloudPhysics helps customers leverage expert resources to plan and execute public, private, and hybrid cloud migration through analytical assessments and simulations. Headquartered in Santa Clara, CA, CloudPhysics serves thousands of users worldwide across major industries and supports a growing partner network. Learn more at http://www.CloudPhysics.com. Press Contact: John Blumenthal (john@cloudphysics.com).